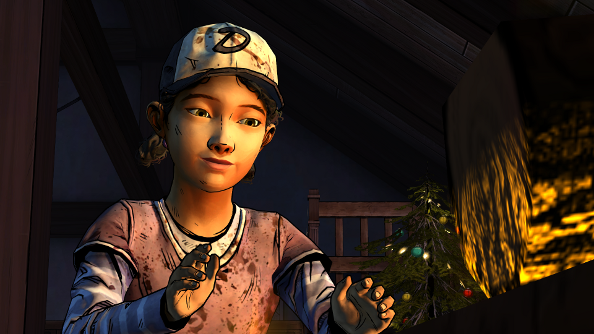 A House Divided wastes no time in throwing our pint-sized heroine Clementine into mortal danger. Picking up straight after All That Remains, Clem finds herself holed up in a broken down cigarette truck, zombie-bitten friend next to her – who I chose to go with at the end of the previous episode – and the walking dead scratching at the doors. It’s an appropriate location, seeing as that I would go on to spend the rest of the two hour episode chain-smoking. A House Divided might be a more chatty, subdued episode, but it’s not without nail-biting intensity and decisions nobody should have to make. Least of all an 11-year-old girl. 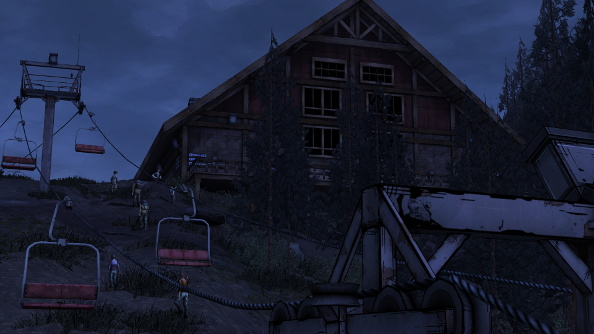 While All That Remains thrust Clem into a group of strangers – where, despite being surrounded by people, she was essentially alone – the second part of Season 2 sees her brought into the fold. Relationships start to take shape and all those faces I wasn’t quite sold on last year start to become fleshed out characters. “Okay,” I think to myself. “Lone wolf survivalist Clem is out; brave, self-sacrificing Clem is in.” Despite the name of this episode, it’s as much about people coming together as it is division. Family, trust – these are essential things that people can cling onto during times of tragedy. Cocky, wise-cracking Luke; caring, fatherly Alvin; stupid, yet repetent Nick; nervous, sympathetic Sarah – this new group rapidly worms its way into one’s conscience, if not one’s heart. While their first meeting with Clem was not a good one, she gains their trust, and in turn, it’s hard not to want to look out for them. But trying to do the right thing can put both Clem and her new cohorts in all sorts of danger. Not that danger isn’t always lurking around every corner. A new villain rears his head: Carver. He’s instantly familiar, despite being a new character. Charismatic, but violent and possessive; Carver is the game’s answer to the comic’s Governor. He’s also the impetus for the trek the group makes to a new safehouse. It’s during that trek that Clem starts to seem like one of the “gang”. Jokes are cracked, zombies are put down with confidence, and despite a horrific, unavoidable misstep, things start to look up. That’s A House Divided’s greatest lie. It’s a horrible trick. It’s also what elevates it above All That Remains. The pacing is perfect. The episode slowly builds up to all its high points. Not attempting to shock and disgust like the last episode, it simmers away, letting you get comfortable before making you nervous until it finally builds up to something terrible. And it does this more than once. Hence the chain-smoking. I get the feeling that all of my future reviews of Season Two are going to contain at least a little bit of gushing about just how wonderfully realised Clem is. As her new group gets to know her, we go over old ground and open old wounds. There’s a lot of reflection; painful reflection. I confess one instance left me a big of a mess. I swear that the beginning of a tear was just the smoke getting in my eye. Honest. While the action is not as grisly as in the last episode, A House Divided still gives Clem plenty of opportunities to show off her killing skills. Many a bullet finds its way into the brain pan of a zombie, and one hammer. One kill stands out from all the others though. 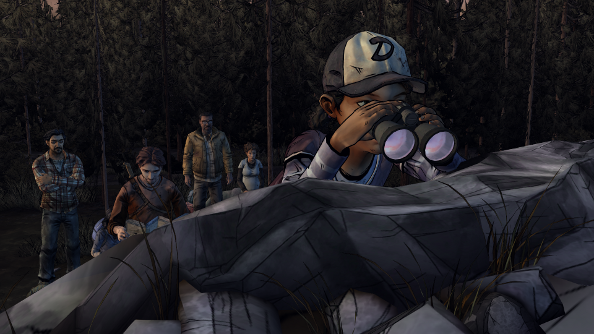 Luke and Clem are doing some scouting, and come across two shambling corpses. Luke tells Clem to take the little one, which I thought was patronising. So I make her kill the big fella before he gets to it. After she rips the hammer out of its skull, she just stands there, grinning. Covered in blood and viscera, an 11-year-old girl smiles proudly at her new friend. Another cigarette is promptly lit. At the heart of A House Divided is a struggle. 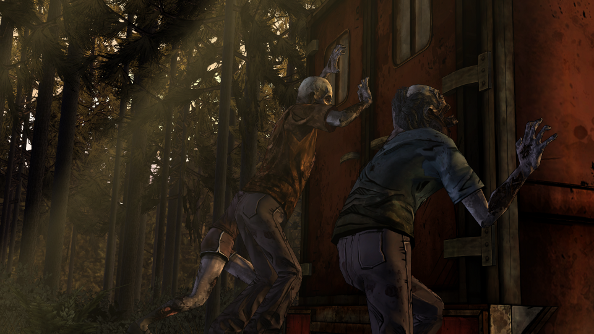 Clem is put in an incredibly awkward, potentially dangerous position where she has to take sides. This isn’t new to The Walking Dead, but I’ve always felt sure of myself in those situations, much more so than the other dramatic choices that need to be made. In Season One, there was a tendency for these “pick a side” moments to give you the option to choose an unhinged person or the person speaking a lot of sense. It’s not that simple this time around. I think I made the wrong choice. But I also know that I’d say exactly the same thing no matter what decision I made. It was a heat of the moment thing, and one that stays true to how my version of Clem is developing. And that’s what really sets The Walking Dead apart from other narrative-heavy games. Right, wrong or somewhere in between, the choices you make are part of a tapestry that leads to a fallible, believable protagonist. A House Divided absolutely nails this. Any doubts I had during the first episode have been washed away. 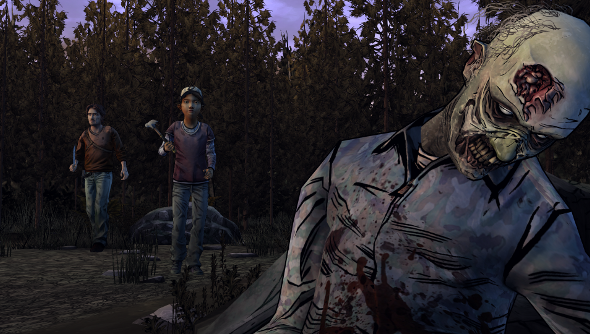 This is Telltale’s storytelling ability at its very best. Filled with emotionally resonant dialogue, painful scenes and a cast that’s quickly matured, A House Divided makes it seem possible for The Walking Dead Season Two to eclipse its celebrated predecessor.